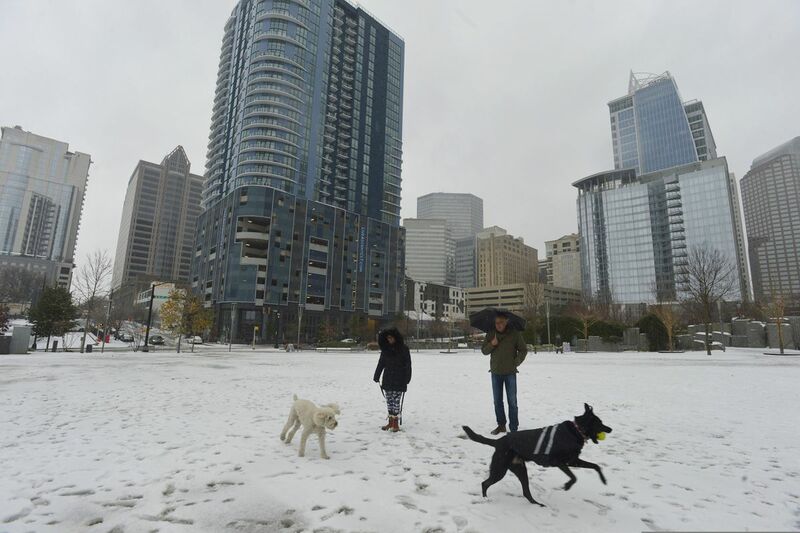 DURHAM, N.C. — Residents walked instead of driving cars and children enjoyed another day of building snowmen with school canceled Monday after a wintry storm dropped snow, sleet or freezing rain across five southern states. Accidents on snow-covered interstates caused major delays over the weekend. Hundreds of flights were canceled and drivers in North Carolina and Virginia got stuck in snow or lost control on icy patches. At least two deaths were reported in North Carolina. But the commuters' nightmare provided pre-winter thrills for kids and the young at heart, who were able to go sledding and build snowmen in places that don't often see so much of the white stuff. Scores of schools canceled class. In North Carolina’s Durham County, where a foot fell in places Sunday, kids reveled in a day off from school as a second dusting of snow and sleet fell Monday morning. Two boys were digging in the snow on an embankment near the woods. On the sidewalk in a nearby neighborhood, a young girl in a pink jacket threw her hands up and yelled "Merry Christmas!" at a passer-by. Elsewhere, children sledded, threw snowballs and built snowmen. A few cars passed on the road, but several people decided it was safer to get where they were going by foot. Andrew Dedman, 16, was walking about a mile through a flurry to visit a friend on their day off from high school. "We're just going to hang out, sit around, drink hot chocolate," he said. Nearby, a woman was starting a walk of several miles to get to her job at Duke University. The woman, who declined to give her name, said she was surprised to see the snow sticking again Monday morning. Her husband was picking her up at the end of the day in a car that has good traction, she said. North Carolina Gov. Roy Cooper said Monday that the worst of the storm had passed most of the state but residents — particularly motorists — should keep watch for dangerous conditions. Snow and ice that had fallen since the weekend could result in slick road conditions Tuesday morning as temperatures fall and moisture refreezes, Cooper said at a news conference. The state emergency operations center attributed two deaths to the storm. One man died Sunday when a tree fell on him in Mecklenburg County, while an ailing woman died in Haywood County when her oxygen was cut off due to power outages. Elsewhere, five members of a dive team searched the Neuse River in Kinston, North Carolina, for a missing driver Sunday after a tractor-trailer ran off a road and into the river, WRAL-TV reported. Governors and local officials declared emergencies ahead of the storm crossing several Southern states, which hit portions of North Carolina and Virginia particularly hard. Flight cancellations and delays continued Monday at Charlotte Douglas International Airport, the sixth busiest airport in the country. The airport had nearly 400 cancellations, about one-fourth of its scheduled flights. More than 244,000 power outages were reported across the region Monday morning, with North Carolina bearing the brunt of it, according to poweroutage.us. South Carolina, Virginia and Tennessee also had outages reported Monday.